Anticipating Peter Greenaway’s second feature The Draughtsman’s Contract (1982) by three years, Leslie Megahey’s Schalcken The Painter is a similarly superlative film about the mystery that lies behind and within a painting. Those familiar with Greenaway’s more recent Nightwatching (2007) will find much to delight in here especially, for the narrative revolves around the genesis of a seventeenth-century Dutch painting. To imagine the story behind a painting has demonstrably more scope for cinematic treatment than that of a literary work. While Nightwatching was named after one of Rembrandt’s paintings – and dared to imagine the darker imperatives that led to its creation – Megahey’s production adapts from J. Sheridan Le Fanu’s fictionalisation of the events that informed the work of Godfried Schalcken. Schalcken belies its origins. Megahey wrote the script for the BBC’s Omnibus series, and it originally aired on television just before Christmas 1979. For all other purposes, however – highlighted by its high-definition presentation here as part of the BFI’s ongoing Flipside series – it looks and feels like a bona fide horror film, complete with sumptuous period details, meticulous sound design and sterling cinematography from John Hooper. The film attains its eerie atmosphere early, with the sound of bells over a black screen accompanied by an ominous drone, and it sustains such qualities for its remaining 70 minutes. “Out story begins in 1665,” so says our narrator (Charles Gray), in Schalcken’s studio. Schalcken (Jeremy Clyde), “a man of great ambition, foul temper and few manners” is the pupil of Gerrit Dou (Maurice Denham). In love – “as much as a Dutchman can be” – with Dou’s niece Rose Velderkaust (Cheryl Kennedy), Schalcken lacks the financial clout with which to secure Rose’s hand in marriage, and when a strange figure named Vanderhausen (John Justin) arrives in the night asking to take Dou’s niece as his bride, Schalcken looks on helplessly. Impressed by such measures – “marriages were matters of traffic and calculation” – Schalcken takes it upon himself to make money, by painting commissioned works, in order to buy Rose back. In his pursuit of wealth, he is corrupted. The film has a slowish, bedtime-story build. Gray’s voice-over lends an anecdotal promise: hang around, the omnipresent second person address implies, and you’ll be amply rewarded (and indeed, its anecdotal charms make certain ghoulish elements all the more macabre). Megahey matches Le Fanu’s framing device by shooting through doorways and by emphasising the geometric, staged compositions of seventeenth-century Dutch painting. 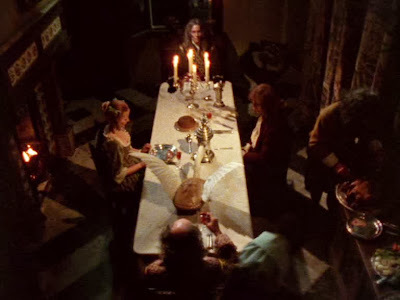 Elsewhere, the director demonstrates a keen sense of symbolic visual arrangement, as when Schalcken warily eyes Vanderhausen at the dinner table before looking over at Rose; the latter returns his gaze with an eye-line match, and though the pair share the same screen space (left-of-frame), the editing separates them so that they cannot exist in the same frame at once. Any connection between the would-be lovers is figurative: physically (materially! ), they are kept apart. Simon Wilson’s sound work is excellent: the harsh crack of a paper dowry being unfolded, or of ink being scribbled onto a surface, lends a cacophonous edge to on-screen tensions. Indeed, the clunks, chinks and scrapes that pervade the silences here undercut Hooper’s candle-lit visual warmth: the mastery of the Dutch painter’s flattened canvas negates the contradictions that led to its completion. Megahey’s film enlivens the immortal, makes it flesh once more.